A lightweight PHP paginator, for generating pagination controls in the style of Stack Overflow and Flickr. The 'first' and 'last' page links are shown inline as page numbers, and excess page numbers are replaced by ellipses. A lightweight PHP paginator, for generating pagination controls in the style of Stack Overflow and Flickr. The "first" and "last" page links are shown inline as page numbers, and excess page numbers are replaced by ellipses. These examples show how the paginator handles overflow when there are a lot of pages. They're rendered using the sample templates provided in the examples directory, which depend on Twitter Bootstrap. You can easily use your own custom HTML to render the pagination control instead. // Example of rendering the pagination control with the built-in template. // See below for information about using other templates or custom rendering. 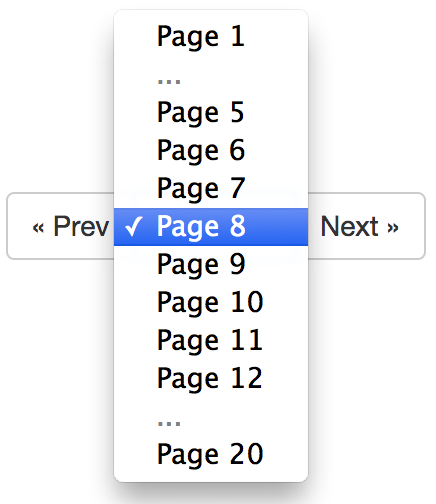 If the example templates don't suit you, you can iterate over the paginated data to render your own pagination control. <?php echo $paginator->getTotalItems(); ?> found. See the examples directory for more sample templates.